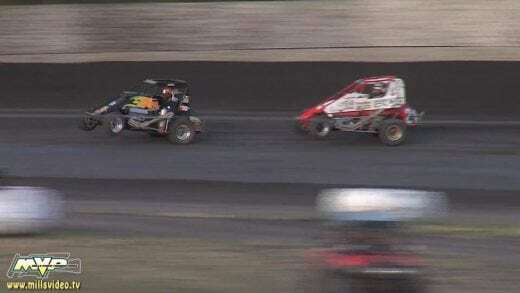 Gerhardt wins Sunday Afternoon at Stockton 99 Speedway Jesse Love 2018 BCRA series champion By Bob Roza A special Sunday afternoon Bay Cities Racing Association (BCRA) season-ending racing program closed out 2018 and concluded a big two-day weekend show at Stockton 99 Speedway that also featured the BCRA vintage division, the Gunslingers Sprint Cars, USAC Western Speed2 midgets and the Legends of Kearny Bowl. The afternoon opened with BCRA Midgets time trials with Chad Nichols setting fast time at 13:105 over Mark Maliepaard from nearby Ripon at 13:229 seconds Jesse Love who was aiming for his fourth straight BCRA win was third fastest at 13:354 seconds. After hot laps, car owner Karl Hokanson withdrew his immaculate #98 car from competition due to internal engine problems. Karl has had a tough time getting the bugs worked out of his beautiful #98 machine, as problems have surfaced after hot laps at each of the car’s last three outings at Madera and Stockton. The first heat race was won by midget rookie driver Dylan Nobile from Fresno in the recently purchased Mopar powered Beast formerly owned by Gary Conterno. Finishing behind Nobile were Love, Nichols, and Richard “Skeeter” Flake who made the long 12-hour tow from Washington state to race with the BCRA midgets. The second heat race was won by Malipaard from his fourth-place starting position over Gerhardt, Floyd Alvis and Maria Cofer who failed to finish after her black #88 machine suffered front axle damage from contact with a spinning car. For the final racing event of the 2018 racing season quick qualifier Chad Nichols drew the zero pill, for a “straight up” starting field based on qualifying times, with Nichols on the pole position and Maliepaard on the outside. 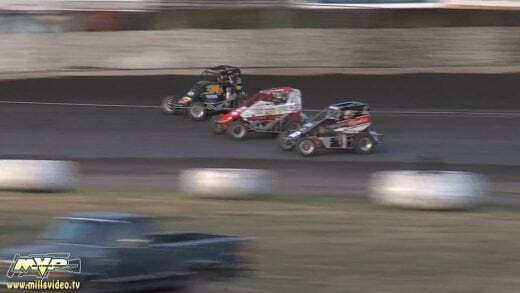 When the initial green flag flew, Nichols bolted into the early lead over Love and Maliepaard, however Love’s blue #5 midget owned by Tres Van Dyne began to slow immediately. Love’s engine popped and backfired as Jesse dove into the infield as caution flag was shown to the field. Once the car rolled to a stop, the crew quickly diagnosed the culprit as a bad magneto which meant that the young phenom was done for the night. When racing resumed, Nichols set a fast pace ahead of Maliepaard, Gerhardt and Nobile. Several laps later Cofer pulled her ill-handling Arata Brothers Chevrolet-powered Spike chassis into the infield. 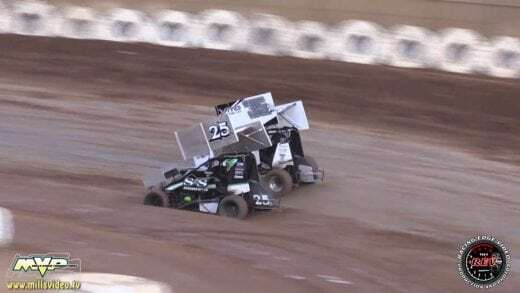 Her car owners, the Arata brothers, Jeff and Anthony, Maria’s father, John Cofer and Tim Grant, the father of the 2007 BCRA champion Justin Grant, all deserve praise for making the needed repairs after the heat race incident so Maria could start the main event. With the race half over the racing continued with Maliepaard, Gerhardt, & Nobile in a spirited battle for second place behind Nichols until lap 18 when Maliepaard & Nobile spun together calling for a yellow flag. 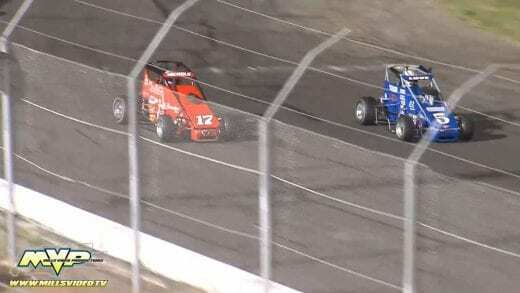 Both cars were restarted and rejoined the tail of the field. When racing resumed Gerhardt closed in on Nichols rear bumper then made a clean pass on lap 20, and lengthened his lead as Chad’s handling issues worsened, eventually diagnosed as a bad steering box. Over the remaining laps, Cody was smooth and fast and he took the checkered flag in the Paul Eskelsen’s Mopar-powered Beast chassis over Nichols, Nobile and Malipaard with Skeeter Flake in the fifth position. With the long season at a close, the BCRA racers gathered to celebrate the accomplishments of the 2018 champions – Maria Cofer emerged as the dirt driver champion, Chad Nichols repeated as the pavement driver champion, and Jesse Love is the 2018 BCRA overall series driver champion. Love will reign as the youngest-ever BCRA driver champion in the club’s long storied 79-year history. Love’s car owner Tres Van Dyne is the series overall owner champion, while Team 17 captured the pavement owner’s title and John Cofer repeated as the BCRA dirt division owner champion. The Bay Cities Racing Association thanks all of the competitors who participated in our final weekend of racing for 2018, our valued sponsors and especially Business Manager Linda Manning. The club also extends our thanks to all the series’ fans, racers, promoters, and sponsors for their support throughout the 2018 season. 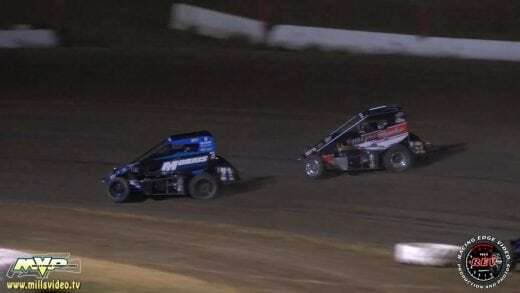 Jesse Love makes it three wins in a row at Stockton 99 By Kevin Triplett The Bay Cities Racing Association (BCRA) mighty midgets raced on Saturday night October 27 as the first part of a special 2018 season-ending racing program at the lightning fast Stockton 99 Speedway. 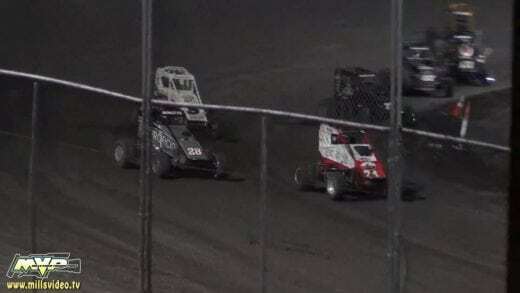 and concluded a big two-day weekend show that also featured the Gunslingers winged Sprint Car series, the BCRA vintage division, USAC Western Speed2 midgets and the Legends of Kearny Bowl which featured an entry from six-time BCRA champion Gary Koster. Twelve BCRA midgets signed in at the pit gate and the entry list included Cody Jessop in Karl Hokanson’s beautiful #98 midget which suffered mechanical plumbing problems during practice and was withdrawn. Mark Maliepaard topped the charts in time trials with a quick 13.157 second lap to edge out Jesse Love who recorded a best lap of 13.221 seconds. David Goodwill and Cody Gerhardt were third and fourth fastest respectively, while Chad Nichols surprised many as he struggled and was the day’s fifth fastest qualifier. Rookie Dylan Nobile of Clovis in his BCRA debut in the #55 midget formerly owned by Gary Conterno was sixth fastest, trailed by Maria Cofer, Richard “Skeeter” Flake from Washington state, the affable JR Williams, nine-time BCRA champion Floyd Alvis and George Tuttle, who was doing double duty with the Speed2 midgets. Chad Nichols in the Shanoian #17N Esslinger-powered midget started the first heat race from the pole position with Maria Cofer alongside, as five cars took the green flag after the engine in Tuttle’s beautiful black #98T car wouldn’t start. Nichols grabbed the lead into turn one ahead of Cofer, who was passed by Maliepaard who used a nifty inside move through turn three on the first lap to grab the position. A lap later, Goodwill dropped Maria to fourth place, and the running order remained static from then until the end of the eight-lap race with the finishing order Nichols, Maliepaard, Goodwill, Cofer and Williams. 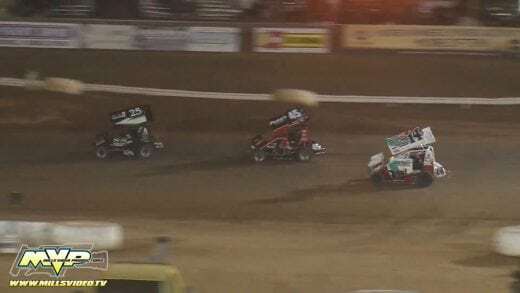 Floyd Alvis led the five-car second heat race to the green flag, but outside front row starter “Skeeter” Flake beat the rest of the field into turn one with Cody Gerhardt in second place and Jesse Love in third place. 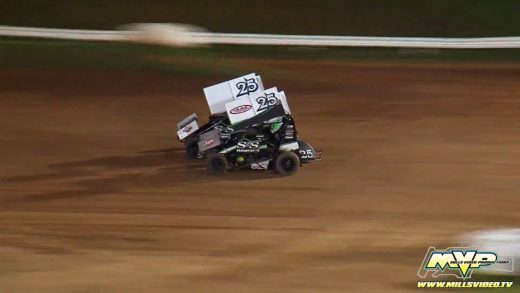 Gerhardt looked high and low at both ends of the track but could not find his way around the Washington midget racing veteran, all while Cody repelled the efforts of the young charger Jesse Love to grab second place. The finish at the end of eight laps was Flake, Gerhardt, Love, Nobile and Alvis. Later the four fastest qualifiers lined up for the four-lap trophy dash in a fully inverted start. Cody Gerhardt made the most of his pole position start and he held off Goodwill, Love and Maliepaard to claim a popular win in the #29 Eskelsen Motorsports Mopar-powered Beast and $100 donated by Race Director Bob Roza. After the heat races and the trophy dash were completed, the re-draw for the start of the feature was held. The fastest qualifier Mark Maliepaard drew the magic “zero” pill for a straight-up lineup with the fast qualifier in the coveted pole position. At the drop of the green flag, Mark and fellow front row starter Jesse Love raced side-by-side for the first lap around the ¼-mile high-banked oval before Love thrust into the lead, trailed by Maliepaard, Goodwill, Nichols and Gerhardt. 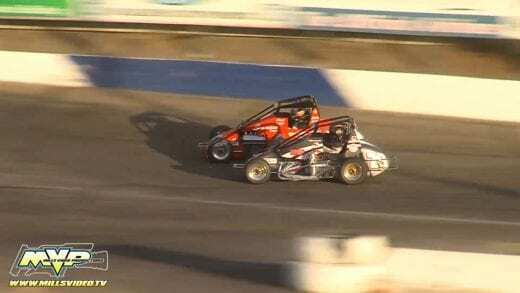 On lap four, Nichols slipped past Goodwill and Chad had a front row seat as Mark and Jesse battled for the top spot. On lap 12, Nichols passed Mark Maliepaard, then two laps later. Goodwill dropped Mark’s #51 Fit & Finish Hot Rod Interiors Special into fourth place. The caution flag flew on lap 14 after the black #81 machine of “Skeeter” Flake rolled to a stop in turn two and he was pushed into the pit area to join early retiree JR Williams who had experienced an engine oiling issue. The ensuing restart got jammed up and unfortunately, young Dylan Nobile was the innocent victim as his #55 ended up nosed into the outside retaining wall at the end of the front straightaway. The car was undamaged but Dylan headed to the pits, his night over early. 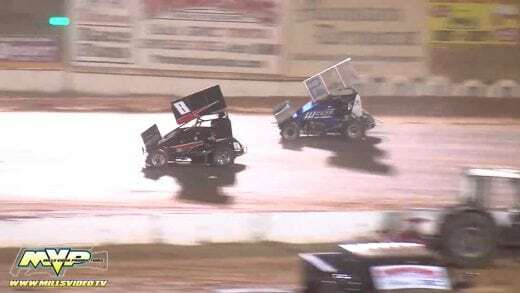 The next restart was clean and over the next nine laps, the crowd at Stockton 99 Speedway was treated to an epic battle for the race lead between the young phenom Jesse Love and the wily veteran Chad Nichols. Nichols’ orange #17N was brutally fast on the straightaways, but Chad’s machine could not hold the low line through the turns. Lap after lap Chad got underneath Jesse as the pair entered the corner, then edged ahead mid-corner, but Nichols just couldn’t make the pass stick, as Love would diamond off the corner and power underneath to retain the race lead at the start-finish stripe. 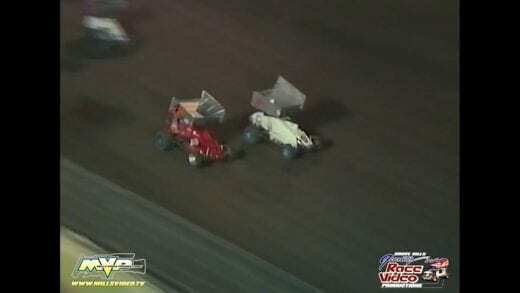 After lap 23, the exciting battle ended and Love began to pull clear of Nichols. 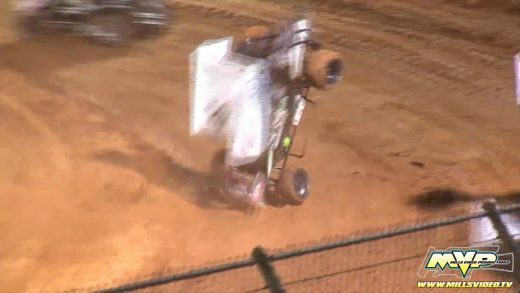 Jesse cruised to his third consecutive BCRA midget pavement win over Nichols, Gerhardt, Goodwill, Maliepaard, Alvis, Cofer, Flake and JR Williams.